My reading game has been strong this year! That's not a difficult task (or a task at all, really) when the books are so good you can't help but settle into the couch with them, alongside a mug of warm tea in the morning. Which is exactly what I've been doing! Instead of messing around on my phone or the computer immediately after waking up, I've been making a conscious effort to sit down and read for a little while first. Lloyd usually settles into the couch next to me, and most days I look up at the clock and realize that an hour or two have flown by! I borrowed two books from a friend of mine; one of which I couldn't get past the first 30 pages (Everything is Illuminated), the other of which I devoured in less than a week. You're probably all familiar with the film version of Catch Me If You Can... but you should really read the book. I seriously couldn't put it down! It's a memoir worth reading. Some time last year I picked up Not That Kind Of Girl for $1.99 at Urban Outfitters. I'm a fan of Lena Dunham's show Girls, so I figured her book would be along the same lines. While it didn't grip me in the same way that other popular female comedienne's memoirs have in the past, I don't consider it to have been a waste of my time. The illustrations that accompany the essays were my favorite part. 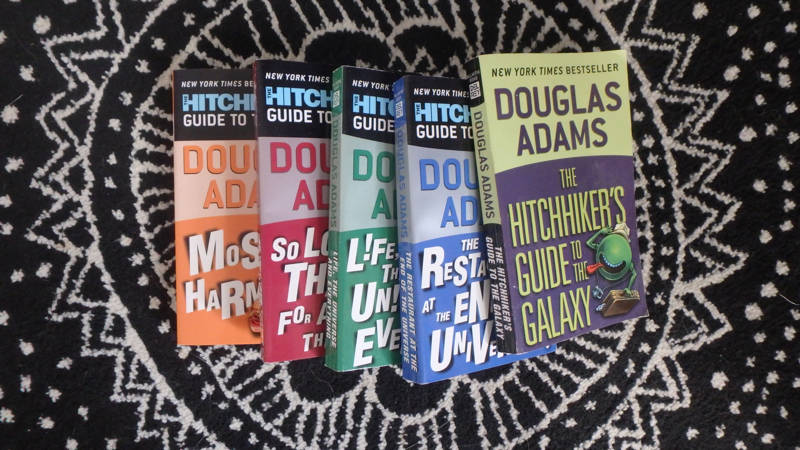 The highlight of my bookshelf these past few months has been The Hitchhiker's Guide to the Galaxy series. I don't know why I didn't read it sooner! I bought the first book to read on the plane on my way to Spain last year... it was so good that I went out and bought the second book, and then I got hooked. The movie is really only vaguely based on the first book in the series, but there is so much more to the story. I'll admit that the third and fifth books were not my favorite, but the series is still worth a read.